Have you ever had colcannon? A St. Patrick’s day favorite, colcannon is an Irish potato recipe, a mixture of creamy mashed potatoes and usually kale or cabbage. 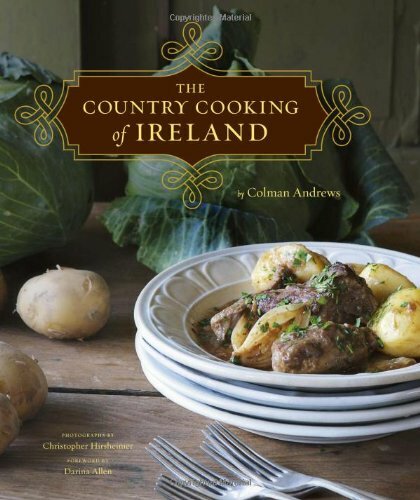 I first encountered colcannon potatoes while doing research on traditional Irish cooking. Not surprisingly the Irish have all sorts of ways of cooking potatoes, with festive names like champ, bruisy, pandy, boxty, and this one, colcannon. In the following colcannon recipe, we mix the mashed potatoes in with chopped cooked kale, green onions, milk or cream, and lots of butter. To serve, make a depression in the middle of the mashed potatoes and put a knob of butter in it. To eat it, you dip a forkful of the potatoes in the melted butter. If ever there was a recipe to get one to eat one’s greens, this is it! 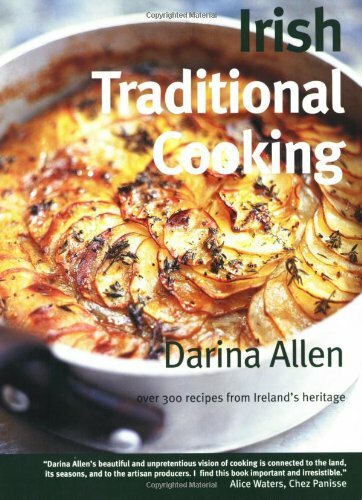 by Darina Allen, of the Ballymaloe Cookery School in County Cork. by Colman Andrews, which won the James Beard award for cookbook of the year in 2010. Updated March 12, 2019 : We spiffed up this post to make it sparkle! No changes to the original recipe. For a variation, sub out half of the potatoes with parsnips. Can add chives, leeks, or bacon too. 1 Boil the potatoes: Put the potatoes in a medium pot and cover with cold water by at least an inch. Add 2 tablespoons of salt, and bring to a boil. Boil until the potatoes are fork tender, 15 to 20 minutes. Drain in a colander. 2 Cook the greens and the green onions with butter: Return the pot to the stove and set over medium-high heat. Melt the butter in the pot and once it's hot, add the greens. Cook the greens for 3-4 minutes, or until they are wilted and have given off some of their water. Add the green onions and cook 1 minute more. 3 Mash the potatoes with milk or cream and greens: Pour in the milk or cream, mix well, and add the potatoes. Reduce the heat to medium. Use a fork or potato masher and mash the potatoes, mixing them up with the greens. Add salt to taste and serve hot, with a knob of butter in the center. Hello! All photos and content are copyright protected. Please do not use our photos without prior written permission. If you wish to republish this recipe, please rewrite the recipe in your own unique words and link back to Colcannon on Simply Recipes. Thank you! Yum! Lots of room for variables too. LOL! Yes, yes it certainly is. This recipe was amazing! Made it for St Patrick’s Day and served it with grilled lamb loins. Will make it again! I change the green onion to roasted garlic. 2 bulbs cut off top roasted whole with oil in tin foil 1 hour at 350 degrees Then squeeze out yumminess. I decided to go the healthy way : 4Tbsp of butter was more than enough to cook the greens, and i didn’t have milk or cream at hand, so i saved a bit of the cooking water for the patotoes, drained the rest, sprinkled them with dried parsley and chives and then poured back about half a cup of cooled potato water while mashing them up. This is the traditional way to mash potatoes, to get the real, genuine potato taste. Ask a french cook! Of course, he’ll say you need to add in some fat, butter or oil, but you have the greens that you sauté’d in with… Just Add ‘Em Up And Voila! Mine were perfect like so. A touch of spice-infused oil when serving would be nice too. This is good for people alergic or intolerant to milk and/or nuts. Another tip : while cooking your cabbage/kale, sprinkling over some lemon juice or vinegar will help your stomach digest it, plus it gives a bit of a tangy taste to the meal. Adding a bit of ground cumin makes it extra special! …And so on! This recipe is a keeper. I slowly sauté sliced regular yellow onions along with the cabbage til caramalized. Mixed with mashed potatoes it’s Devine! Most traditional Colcannon recipe I’ve found – truly luscious. Many others I found added bacon or ham when the poor Irish that ate this wouldn’t have had either. I made these for our St. Patrick’s day meal. They were a big hit! I followed the recipe exactly. They were pretty easy to make and very tastey. I used Irish butter to make it extra special. Highly recommend. Hi Rachel, Irish butter makes everything taste better, doesn’t it? So glad you liked the colcannon. Made this twice. It is a great recipe. Tonight I had both kale and collard greens that I wanted to use up and the combination was great. I made a single batch of this yesterday, tasted it, and immediately went to the store to get ingredients for a second batch. So. Good. I used heavy cream instead of milk. How did I ever live without this?! It’s not traditional; but I make Colcannon and then add crumbled cooked breakfast sausage to it…my family, including my very finicky son, can’t get enough of it! I just happened to have all the ingredients (including Kerrygold Irish Butter) on hand. This was awesome! And so easy to make. Thank you! This is my favorite dish and I look forward to it every year! My dad makes it with cabbage and adds cut up corned beef to it; it’s absolutely fabulous! My great grandmother from County Down always made this with baked potatoes and spinach … and so do I! Being diabetic shouldn’t keep you from eating potatoes unless you’re allergic to them.. I’m a Type I diabetic using insulin for 50 years and counting. You DO have to learn to count the carbs in anything you eat.